There isn't any glitter used in our mineral makeup products. However, sometimes women confuse the hint of shimmery particles they see in our minerals when held in certain light as being the same as glitter, and are worried this may cast a glittery or sparkly effect on the skin. How the loose minerals appear in the jar will be quite different than how the finished look will be once applied and melded to moisturized skin. Women of mature years especially don't want to look like a glitter ball, but do want a healthy glow brought back to their skin which can only be achieved with a certain amount of Mica in mineral powders. 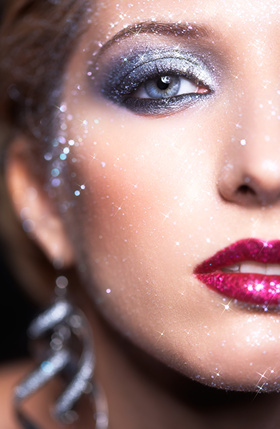 Glitter as a rule is used for dramatic effect in makeup for highlighting areas of the face for costuming, parties and gala events because it is so eye catching. What you are seeing in our mineral makeup products, is the small amount of mica we include in all of our formulas except for Evening Rose Veil. Mica is made up of tiny flat platelets and has wonderful light refracting properties. Mineral makeup that is made with nano sized mica, 1 micron and smaller, will appear quite matte, but will also lose that luminosity that women of mature years are trying to restore. A mineral makeup without Mica or containing nano scale mica, would be like any other makeup, flat and lifeless on the skin unless supplemented with Bismuth Oxychloride, and this is a potential skin irritant. Mica is what contributes to the 3D effect that makes the skin appear flawless, polished, youthful and beautiful. Our Mica is used in limited amounts and does not comprise the base of our formulas. Plus, our mica is combined with a surface treatment of Methicone, and once applied to moisturized skin or with the "Moist Method" of application, the results will be nothing short of amazing. The tiny flat platelets and the methicone polymers adhere to the face, and the mica acts like tiny little mirrors, reflecting light back from the face, creating soft focus and a healthy glow. Never, ever shiny or sparkly! But you'll never experience the irritation that can come from using other mica based mineral makeup products. Try it and you'll be overjoyed and amazed at how natural you'll look as our mineral makeup restores your skin to it's youthful appearance once more. Mica is used as intense color in high ratios only in our eye colors when different levels of shimmer are wanted. Basically achieving looks from semi matte to high shimmer with some sparkle, but still never glitter.